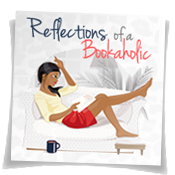 Reflections of a Bookaholic: Would You Chance It? I've seen these around. I'd be afraid that my book would fall in. Not sure I could chance it. Could you? Does anyone have one? I would NEVER! I try to take care of my books, I spend a lot of time finding bags that will cause minimum damage to them,if I dare take them out at al!!! I'm not as careful as you but I certainly agree. It just seems like such a risk. That's why I can't bring myself to purchase one even though it looks quite cozy. I have seen a lot of pictures like this. It looks so nice, romantic, relaxing, but it makes me cringe EVERYTIME! No I would not chance it! Never. Even at the pool I am very careful with my books and always put it where it can't get wet and always wipe my hands real good before touching, but then I am a tad OCD! I don't read by the pool often. If I do, it can't be a day where I plan to get it, and it it's usually not around a time where there are tons of people in it. They might splash and get my book wet. Afterall, fire and water are the worst things for books. "They might splash and get my book wet." 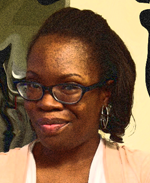 - I'm also talking about an adult only pool! I would never take a book to a pool with kids! Gasp! Haha! I'm talking about adults! Hmmm... I might need to find new friends or maybe new adult friends that don't splash in pools. It looks so inviting..but eep what if????? Great idea! I guess I could experiment a bit. I agree. Though I've been convinced that this is just a bad idea. I've tripped and knocked my laptop into the bathtub before. So... talk about clumsy. I only get in tubs when I'm at hotels, lol, so it wouldn't be practical for me. I have to have one. It's how I relax. EEEEEEKKKKKKK RUN AWAY!!! That is just too rebellious for me. I know!! I feel the same. Lol! You are so right. I forgot about the trendy population. I definitely read in the bathtub but I'm extra careful. It's so relaxing to me. I've never dropped a book. But that thing...it's not exactly in my hands. I don't trust it. No! Handy for holding the wine but when it comes to books, my hands would be a lot safer. I would not trust this! That's what I said above. I trust my hands so much more. Lol, no way! I would be so mad if I got my book wet. I'd use my old Kindle with the waterproof cover! I won't take my iPad or my eReader into the tub. Technology hates me so I can't chance it. Haha. No discussion need, I suppose. Heck yes! But then, only with certain books. Sometimes I buy used copies specifically so I can read in the bathtub. It could be more attractive, though. That thing is kinda ugly. I think the background makes it look much better than it is. I don't buy special copies for the tub but I NEVER brink an electronic reader in the tub either. I love the idea, but in practice, I can't read from that far away. So it would be useful for the wine glass, but not for my book. And it seems to me the side of the tub would work as well for a wine glass, cup of tea, or mug of cocoa. I hadn't thought about that! I wouldn't be able to read that far away either. Even if I could, it wouldn't be comfortable. My tub is big enough that I've got a large side to put a wine glass and a book. I should be satisfied with that. I would buy this. Like everyone else I would only us this with used Mass Market Paperback copies and my Kindle would be nowhere near this. So use it in a limited capacity. I can understand. Yeah I've tried reading in the bath tub before, it's not as comfortable as it looks and I had to keep constantly drying my hands so I finally just got out of the tub and dried off xD. I don't know if I would try it. It looks so comfortable and relaxing, and I probably would do it with a paperback I got for way cheap. Never with a library book or my NOOK. Or maybe even a magazine or newspaper I definitely would. What I prefer is listening to audio books, that way you don't risk ruining books, and you can really relax and not worry about ruining a good book right? I like listening to audiobooks but I prefer to read a nice paperback while in the tub. I've never dropped it or had a problem. I think it would be problematic with this thing though. I'd have to pass. I used to read my books in the bath. But I'd never prop them up on something like this. I'd have to have them firmly in my hands! It really does look scary like that. I always read in the bathtub and have had no problems. I've never used a contraption though. I always trust my hands. I guess that's what I'll keep doing well into the future. This both fascinates and terrifies me. I think I would end up using the tray just for the wine, and holding the book. Haha. That's a good idea. I think I could use the side of the tub for the wine but mine is pretty wide. hmmm, i wouldn't. i wouldn't mind a magazine falling in ... a book....? NOPE! Magazines are expensive too! I agree though. 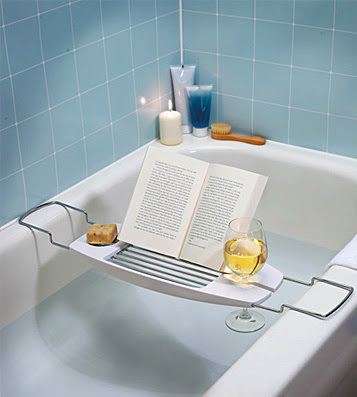 OK, I don't have a bathtub in my current apartment but I would SO love this, mainly for the wine glass holder. I would definitely be too nervous to put my Kindle on there. Print book? I used to read all my Nancy Drew and Babysitter Club books in the bathtub growing up, and many of them fell in the water, so I'm relatively unworried about that. 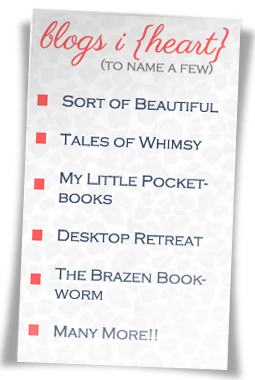 Definitely wouldn't bring my first edition of GWTW in there though! I would never trust an electronic doo-dad on it. I've done a lot of reading in the bathtub and nothing EVER fell in. I feel like I should be knocking on wood.